Written by Cheree Wilhelmsen O.D. Over the past several years, computer use in children and teens has increased dramatically. This includes not only computer use for homework, but also video games and cell phones as well as tablets. Recent research has shown that all of this near work has led to an increase in eye strain, headaches, and even muscle aches in the neck and back. The following are some tips to help minimize computer vision syndrome in kids. Take frequent breaks: encourage kids to take a 20 second break every 20 minutes to help relax the focusing system and help with eye irritation. Check the ergonomics: make sure the work station is adjusted to the size of the child. The recommended eye to screen distance is 18 to 28 inches. The monitor should be viewed at a slightly-downward angle of about 15 degrees. The child’s feet should comfortably reach the floor. Check lighting: minimize glare by placing the computer so that windows are not in direct view when sitting at the monitor. Have your child’s vision checked: before school starts, make sure your child has a comprehensive eye exam to test for any difficulties in distance or near focusing. Many patients ask questions regarding things that they have heard about the eyes. Here I will try to clear up a little misinformation that is circulating out there…. False. Glasses are used to correct blurry vision. If your vision is going to change, it will do so regardless of whether you wear your glasses or not. While you may feel like you are becoming dependent upon them, you are just getting used to seeing clearly. False. Poor lighting can cause eye strain, squinting, and even headaches, but it does not damage the eyes permanently. Good lighting is always recommended when reading and using the computer to alleviate eye strain. Myth: Eating carrots improves your eyesight. False. Carrots are rich in vitamin A which is important for retinal health, but they do not improve eyesight. False. There is no evidence that supports this. Children are able to focus at much closer distances than adults and often like to sit close to the TV. This tends to stop as they get older. Nearsighted children may sit closer in order to see better. If you are concerned that your child is sitting close because they cannot see well, call us for an appointment. Summer is here and the sun is shining! With lots of fun outdoor activities taking up our free time, we are constantly being exposed to UV. Did you know that UV exposure can lead to cataracts, macular degeneration, and growths on the eye known as pinguecula and pterygia? It is extremely important to protect your eyes by wearing sunglasses when outdoors. Clouds do not significantly decrease the amount of UV present and proper sun protection should be worn all year long. Because the risk of eye damage is cumulative over the course of our lives, we should begin wearing sunglasses as young children. Researchers believe that nearly half of a person’s exposure to ultraviolet radiation occurs by the age of 18. Proper sunglasses should provide 100% protection against both UVA and UVB rays. Because UV rays are invisible, they are not affected by the tint color of the lens but by the lens properties or coatings used. Come by today and we will be glad to help you with your sunglass selection! 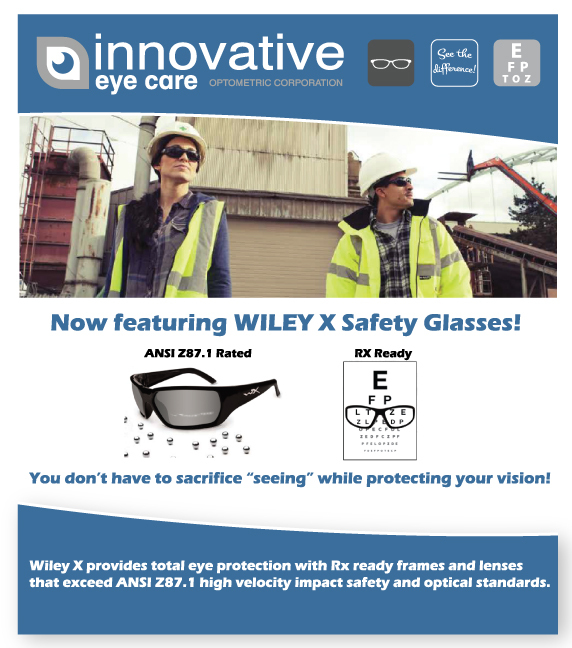 "My husband and I love Innovative Eye Care . Dr. Cheree is wonderful and her staff are so kind. The young lady that helps with picking out the perfect glasses for your face type is so helpful."